21st century schoolboys don’t crew a warship about to go into battle. At least, not unless there's a temporal explosion which tears the fabric of time. Aodhan is the schoolboy who finds himself joining companions thrown forwards in time. David and Brian might be 18th century teenage midshipmen ready for their ship to engage a French frigate, but they’re not ready for a helicopter arriving to investigate and none of them are ready for the task before them. Follow their adventures as they struggle to close the cracks and tears, created by an explosion they barely understand . It seems like bad English to say, ‘Meanwhile, 200 years ago’, but if two events are destined to converge then as one event evolves, meanwhile so does the other. As Captain Spicer of His Majesty’s 28 gun frigate Epsilon lost sight of the French frigate in the fog, so the electrical system in John Richardson’s motor yacht failed. In his turn, he stared at the fog that had sprung up from nowhere. At the same time, at least in the temporal sense, Michael Gordon’s fusion reactor exploded, disrupted by the electrical and magnetic fields that he was generating. It was as well that his obsession for secrecy had driven him to work on a boat, in the Atlantic off Ireland, for the explosion would have taken out a whole city. As it was, Michael was the only casualty, at least in 2107. Captain Spicer shivered, not from the damp, clammy atmosphere but from a superstitious dread of the unnatural conditions. The wind should not have dropped as it did, the ship should not have trembled as if the sea was shaking it and the sea itself should not have welled up pushing the ship up against their feet. Now they were becalmed and helpless. They were not in immediate danger but if the French man-of-war had kept the wind then he would be trying to gain the wind-gage, up wind so that they could bear down on Epsilon at will. Smoke from their broadsides would drift down on Epsilon, blinding its gunners. He looked up in response to a shout from the lookout who was still hidden in the fog. A craft off the starboard bow? What sort of craft? Why was the lookout not more precise? By the standards of the day, Captain Spicer was tolerant but with a French warship nearby, any slackness on the part of the lookout would most certainly lead to a flogging. However, Captain Spicer had caught the lookout's uncertainty. 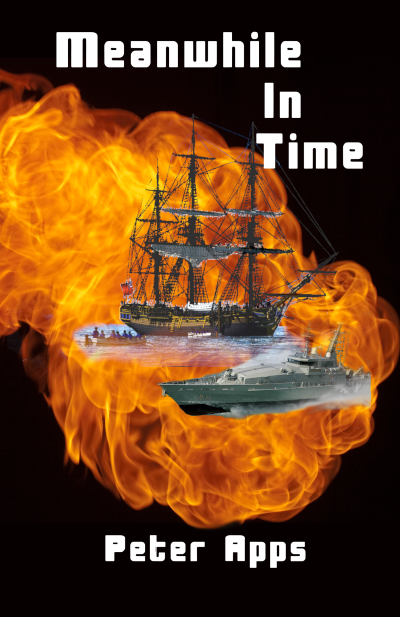 Frigate captains were young, Captain Spicer was twenty-nine, uneasy and full of nervous energy. With little to do until the wind returned, he hurried to the mainmast shrouds then scrambled up the ratlines to the crow's nest, surprised to find himself in clear air. “I’ll be blowed, sir. I've seen midshipmen more puffed than you.” the lookout said. Captain Spicer looked in the direction that Lewis was pointing. The stranger’s hull was still hidden in fog, but he could see cabin like structures with a mast mounted above the largest. Although it appeared intact, he agreed with Lewis, what shrouds there were, would not support it under sail. “No sign of the Frenchie?” Captain Spicer asked then glared angrily as Lewis hesitated. “It’s this fog, sir.” Lewis replied nervously, “I’ve never seen anything like it. Did you feel the ship tremble, sir. When it happened, the sea seemed to boil. It was like a bubble of warm water forced its way to the surface, and it was hot, sir, I felt the warm air rise up from it. That’s when the fog appeared, I suppose the hot air mixed with the cold. Anyway, the fog seemed to collapse unless it was around a ship or a craft sir and it’s still collapsing, you can see the bowsprit now.” Captain Spicer looked around and nodded. “You were telling me about the Frenchie.” he said quietly. “Her fog?” Captain Spicer queried. “Go on.” Captain Spicer prompted. Captain Spicer looked down, the fog had all but gone, and he could clearly see his ship. He could climb back down the shrouds, but he had enjoyed Lewis’ respect of his ability to climb so easily, so he grabbed a line and climbed down like a true seaman should. He was pleased to notice the grudging looks of approval as he hurried back to the quarterdeck. Mr. Davis, a fourteen-year-old midshipman nodded with a cheerful, ‘Aye, Aye sir’, and ran to the mast. He was aware the crew were worried about the strange events engulfing them and the light-hearted exchange reassured them. Captain Spicer was delighted with the midshipman’s response, liking his quick wits and intelligence which made him the best choice to send to the strange craft. He was sixteen now, had been at sea since he was twelve and, assuming he survived he could expect rapid promotion. Briefly Captain Spicer considered sending a lieutenant but with a French ship nearby, he needed his ship to be as ready for action as possible. While Captain Spicer had been organising his response to the strange events that were occurring, John Richardson was accepting he was in deep trouble. The electrical system was completely dead, not only had the power generator cut out but all the batteries had inexplicably drained. Even the emergency beacons in the life jackets were dead. The stand-by petrol generator could be started by a crank but it was not easy. John was fifty-two, had spent his life working in front of a computer and the compression was too much. He was sweating and his legs were buckling under his weight as he admitted defeat, concerned that he could not spin the engine fast enough or for long enough. He was startled at the ‘Ahoy there’, from outside, surprise giving way to relief that help had already arrived and it was enough to give him enough strength to stagger up the ladder that led to the deck. John stared in surprise at the old-fashioned sailing ship, a relic of a war fought some two hundred years before he was born, hove to some distance from his vessel. He relaxed and laughed to himself, his own boat, his pride and joy was a fully renovated motor torpedo boat, and he was certainly being outdone in the historical replica department.